Achomawi, together often referred to as "Pit River Indians"
The Atsugewi were Native Americans residing in what is now northern California, United States, in the vicinity of Mount Shasta, specifically the Pit River area along the Burney, Hat, and Dixie Valley or Horse Creeks. They were closely related to the Achomawi, who lived to their south. Due to their location, they were also known as "Hat Creek Indians" and "Dixie Valley Indians." The Atsugewi lived a relatively peaceful albeit difficult life prior to European contact. They traded with neighboring tribes, bartering so that each group had sufficient resources to meet their needs. They were especially industrious, and prized wealth. When Europeans first arrived, they were able to relate to them through trade. However, the California Gold Rush of 1849 disturbed their traditional lifestyle, bringing mining and other activities that took their lands and led to conflicts as well as diseases such as smallpox that ravaged their population. Finally, reservations were established and the surviving Atsugewi were forced to relocate there. Today, remaining Atsugewi live on or close to their ancestral homelands. American Beaver (Castor canadensis) dam of Hat Lake and Hat Creek in foreground. The "Pit River Indians," of whom the Atsugewi are one group, traditionally occupied lands along the Pit River in the far northeastern part of California. The Pit River is so called because of the pits dug by local inhabitants for the purpose of catching game. The region, from Mount Shasta and Lassen Peak to the Warner Range, has a tremendous ecological diversity yielding a huge variety of foods, medicines, and raw materials. 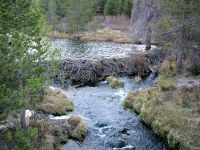 The Atsugewi occupied an area to the south of the Achomawi along three streams—the Hat Creek, the Burney Creek, and Horse Creek (Dixie Valley)—that drained northward into the Pit River. The Atsugewi consisted of two groups (the Atsugé and the Apwaruge). The Atsugé ("pine-tree people") from the Hat Creek area, and the Apwaruge ("juniper-tree people") of the Dixie Valley. Due to their location along the Hat Creek, Atsugé are also known as the "Hat Creek Indians." Hat Creek rises in two forks on the eastern slopes of Lassen Peak in Lassen Volcanic National Park, and flows northward through Lassen National Forest to its mouth at Lake Britton near Burney, California. It has a trout population consisting of wild rainbow and brown trout. In the summer they roamed over the higher elevations of Black Butte and Mount Lassen, while in the winter they remained in villages closer to the river. This area is densely wooded; by contrast the Apwaruge lived in the plains of Dixie Valley, an area with fewer trees although rich in marshes. Estimates for the pre-contact populations of most native groups in California have varied substantially. Alfred L. Kroeber (1925) estimated the combined 1770 population of the Achuwawi and Atsugewi as 3,000. A more detailed analysis by Fred B. Kniffen (1928) arrived at the same figure. Kroeber estimated the combined population of the Achumawi and Astugewi in 1910 as 1,100. The population was given as about 500 in 1936. Prior to European contact the Atsugewi were involved in barter trade with other indigenous tribes of the area. The Atsugewi gave the Achumawi furs, hides, meat, seed foods, roots, and vegetables, and received basketry caps, salmon flour, steatite (soapstone), acorns, salmon, dentalia, tule baskets, and rabbit-skin blankets in return. They gave the Northern Paiute bows, baskets, and shell beads, receiving from them horses, buckskins, red ochre, and glass beads. They gave the Northeastern Maidu bows, twined baskets, furs, and horses, and received clam shell disc beads, coiled baskets, and skins. They gave the Yana buckskin, arrows, wildcat quivers, and woodpecker scalps, and received salt, dentalia, and buckeye fire drills (Davis 1974). The Atsugewi were victims of slave raids carried out by the Klamath and Modoc tribes who lived in the north and rode horses (Aubrey 2006). The Atsugewi who did not have horses could offer little resistance and were captured and sold at the Dalles intertribal slave market on the Columbia River in Oregon (Garth 1978). European fur-trappers and traders arrived in the area in the first half of the nineteenth century. However, it was not until the California Gold Rush of 1849 that they disturbed the traditional lifestyle of the Atsugewi. The Gold rush era brought mining and other activities that took their lands, and also brought diseases such as smallpox that ravaged their population. Conflicts, such as the 1855 Rogue River War involving tribes to their north in Oregon brought a military presence to the area. Finally, reservations were established and the surviving Atsugewi were forced to relocate there. The Atsugewi lived by hunting and gathering, and lived in small groups without centralized political authority. Their villages were organized into autonomous "tribelets" which consisted of a central village and a number of satellites. Industriousness was considered the greatest virtue. Living in a harsh environment with long, snowy winters made it important that everyone work hard to sustain the group. Wealth was measured in terms of furs, beads, and buckskins and the ideal person was one who was "both wealthy and industrious" (Garth 1978). In fact, marriage—arranged by the parents—was based on these characteristics, leading to three social classes: "the industrious wealthy (saswahecar), the commoners (wikoi)-those in a rich man's entourage, and the lazy despised paupers (brumui)" (Garth 1978). They depended on fish and other river resources to survive, as well as on acorns and other vegetables growing in the river valleys. They were generally industrious, working hard to achieve subsistence through hunting and gathering. They practiced division of labor. The men were the hunters and fishers, and they prepared and cooked the meat as well as making clothing from the skins. Although acorns and salmon were their staple foods, they also hunted small game, birds, and waterfowl, as well as deer and antelope in the summer (Kniffen 1928). Hunting parties were often organized for big game. Venison was highly prized and associated with wealth, often being dried and stored for winter consumption (Garth 1978). Fish were a significant part of their diet, and a variety of fish, including salmon, pike, and trout were caught regularly using basket traps, nets, and spears from canoes (Kniffen 1928). Fish were also dried for winter consumption as well as cakes made from the meal of acorns and other seeds and nuts (Garth 1978). The Atsugewi women gathered and prepared plants for food and weaving of baskets and mats. Like other Californian tribes they were masters at basketry, creating beautiful designs colored with vegetable dyes. Summer homes were cone-shaped, with tule matting as coverings. In the winter they lived in partially underground earth lodges, built with wooden frames and coverings of tule, grass, and bark. They had a central hearth and a hole in the roof for ventilation. Excavations in the Eagle Lake area have revealed rock rings and evidence of a central hearth that appear to be the remains of such dwellings (Aubrey 2006). The Achumawi and Atsugewi languages are two closely related members of the Palaihnihan branch of the greater Hokan linguistic family. Atsugewi traditional narratives include myths, legends, and oral histories. Their oral literature reflects the transitional position of Atsugewi culture between central California, Northwest Coast, Plateau, and Great Basin regions. The Atsugewi believed in a spiritual world that could be enlisted to help them in their hard work and to obtain wealth. The "moon-power" quest was practiced at a very young age, with children running outside to address the new moon in hopes of attracting a guardian spirit (Garth 346). "Power quests" began at puberty. Boys had twigs inserted in their ears and were whipped before going into the hills for several days of fasting. During that time a boy was to be active, throwing rocks. If he heard a fawn cry it meant he had hunting power, if he heard the groan of an old man, he was meant to become a shaman (Garth 1978). Shamans were considered to have spiritual powers, including the ability to cure disease. Girls were also sent to the hills, when menstruation began, to observe puberty rites until they acquired guardian spirits. On returning in the evening they danced all night, then spending the day digging roots which were given to the women who sang during the dance. Once a girl acquired a guardian spirit her ears were pierced and she went to the hills one last time (Garth 1978). The dead were buried dressed in their finest clothes. Wealthy men were buried under the floor of their lodge, together with some of their most prized possessions. The lodge was then burned. Mourning was accompanied by cutting one's hair, and wearing soot and chalk on one's head (Garth 1978). Today a small number of Atsugewi live in their ancestral homelands. There are eleven bands of the Pit River Indian tribe, which include the Atsugewi as well as the Achomawi and others. They number around 1,800 tribal members living on the Alturas, Big Bend, Big Valley, Likely, Lookout, Montgomery Creek, Redding, Roaring Creek, and Susanville rancherias, as well as on the Pit River, Round Valley, and X-L Ranch reservations. Aubrey, Val. 2006. Eagle Lake Fishing Information USFS Passport in Time. Retrieved November 22, 2008. Davis, James Thomas. 1974. Trade Routes and Economic Exchange among the Indians of California. Ballena Press. Dixon, Roland B. 1908-1909. Achomawi and Atsugewi Tales Journal of American Folk-Lore 21(81): 159-77, 22(85): 283-287. Retrieved November 22, 2008. Garth, T.R. 1978. Atsugewi. In Robert F. Heizer (ed. ), Handbook of North American Indians, California: Vol. 8, 236-243. Washington, DC: Smithsonian Institution. Kniffen, Fred B. 1928. Achomawi Geography. University of California Publications in American Archaeology and Ethnology 23:297-332. Kroeber, A.L. 1925. Handbook of the Indians of California. Washington, DC: Bureau of American Ethnology Bulletin No. 78. This page was last modified on 26 April 2016, at 23:03.